My name is Jennifer Scott and I’ve lived in Hawai’i for ten years. I’ve lived on O’ahu the whole time, so I’m afraid I’m not much help for the other islands, except to say they are all unique and interesting and you can’t possibly go wrong visiting any one of them! This is probably the place people are going to ask you about when you get home, so you may as well take a day and soak it all in. This is what I like to call “postcard” Hawai’i, with the Diamond Head views, the shallow, swimmable beaches, and the famous landmarks. It’s a really expensive area, but it’s a beautiful place to just walk around when the weather is nice (which is often). Bring a towel—when you get bored of walking, just chill on the beach for a while! 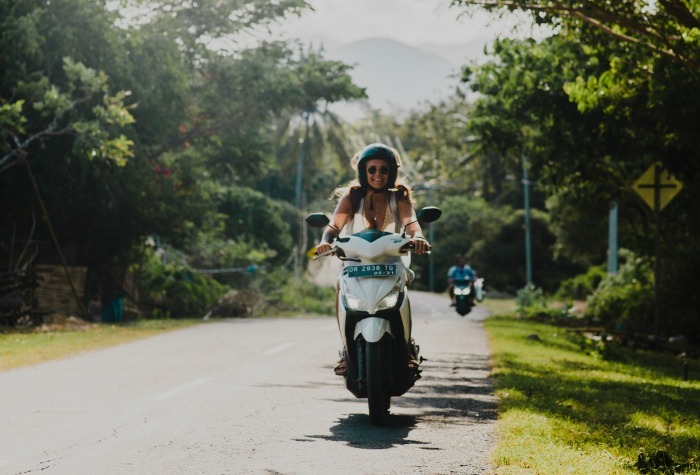 Haleiwa and nearby Waialua are lousy with fun things to do: great beaches, tasty shrimp trucks and restaurants, shave ice stands, and funky little surf shops. This is also where the Polynesian Cultural Center and Waimea Valley Adventure Park are located, which are both pretty great, if a little bit touristy. *Note: if you’re going in the winter, waves on the North Shore can easily get to be 20-25ft high, so if you’re a beginner (or even intermediate), stick to the south! To be fair, you’ll probably be here anyway, but Honolulu is still an interesting place to spend some time. In a mere ten minutes, you can drive from the very urban Hawai’i Maritime Museum at the harbor (right next to the famous Aloha Tower Marketplace) to the Hawai’i Nature Center. The center is a remote way station renowned for its excellent hiking trails. And that’s if you don’t swing through Chinatown on your way there! Everything is pretty densely packed in Honolulu, so you’ll have no problems finding and transporting yourself to all sorts of interesting places. Go nuts! Even if you’re not a hiker, the Diamond Head hike will take you maybe two hours to do, costs under $10 for admission and parking, and the view of the coast from the top can’t be beat. It can get a little slippery in some parts, since it’s surprisingly dusty and dry, so don’t wear your beach shoes, and make sure to bring a light for the dark, tunnely parts. If you go in the winter, keep an eye out for humpback whales! Seriously, walk everywhere you can, especially in the cities. Undoubtedly, you’ll find some neat new shop or restaurant, or you’ll find a cute forgotten little beach or park, or (worst case) you’ll just have a nice little walk in the sunshine. Maybe you’ll get too close to Manoa and end up in the woods, which are also beautiful and lack any large predators. Don’t look at your watch; you’re on aloha time now. Hawai’i is an ocean lover’s paradise, so get out on that water! Hanauma Bay is the single best place to snorkel, hands down, but you need to get there early. Surfing is tough, but fun, and parasailing will get you a great view of the coast. You can also boogieboard, kiteboard, or just splash around in the shallows. Point is: you’re on a tiny little island—get wet! I don’t mean “go to a luau” because they’re usually kind of hokey. But luau foods are all uniquely Hawaiian grinds* and are worth a nosh. Find a plate lunch place (they’re everywhere) that does kalua pork and cabbage, chicken long rice, lomi lomi salmon, poi, and haupia and chow WAY down. So ono**! Warning: poi is an acquired taste, so don’t be alarmed if you totally hate it. I’m going to pause so you can get all of your “ewww’s” out of the way. Better? Good! On the mainland, most people think of Spam as this scary, salty mystery meat. 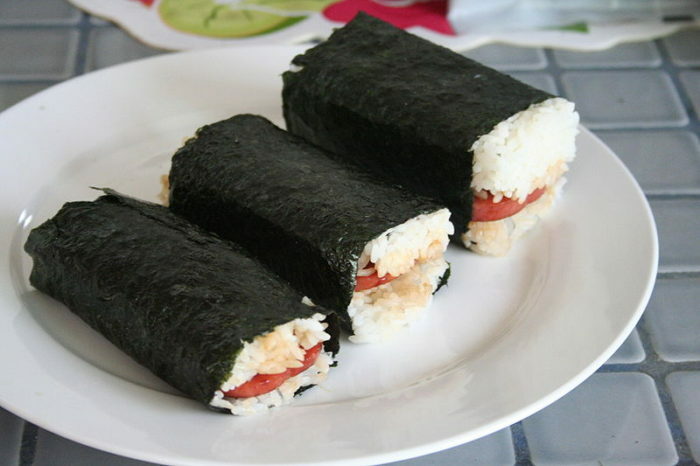 In Hawai’i it’s a staple of the beloved Spam musubi, which consists of a slice of fried Spam over rice and wrapped in seaweed. If you’re feeling brave, try it–you will NOT be disappointed, and it might just change your outlook on Spam. Hawai’i has a very diverse population, and this is definitely reflected in the food establishments available. One of the best ways to get a wide variety local food options for cheap is by getting a plate lunch. There are all sorts of flavors (popular ones are chicken katsu, curry beef, kalbi short ribs, and the loco moco), but they all come with two scoops rice, one mac salad (or vice versa), and they cost only a couple bucks a pop. Li Hing Mui is a sweetly tart reddish-brown powder made out of dried, pickled plums. And when applied to your favorite chewy candies like Sour Patch Kids or gummy bears, it instantly makes them even better. You can also buy the dried plums themselves and chew the red, leathery fruit skin off the pit, which sounds awful, but I swear it’s the absolute best. The heaviest traffic to Hawai’i is over summer and winter holidays, so if you can plan your trip there any other time of the year, the airfare will be significantly cheaper. Renting a car can get pricey, and traffic is pretty awful, but luckily the bus is a fine and relatively cheap way to get around the island. If you want more flexibility and don’t mind getting drizzled on by a freak rain (and there are always freak rains—those rainbows don’t just come out of thin air! ), renting a moped or bicycle is also a great, scenic way to get around the city, and cheaper than a car. There are basically zero budget hotels on O’ahu, but there are a growing number of hostels and couch-surfing opportunities available in Honolulu and BONUS you get to meet locals who can show you all the fun haunts. Definitely a great way to save money and experience the local flavor, if that’s up your alley! If you want cheaper souvenirs, mosey on up to the Pearl Harbor area and check out the Aloha Stadium Swap Meet on the weekend (or Wednesday) for all sorts of neat stuff ranging from cheapo shell leis all the way up to beautiful koa wood carvings, as well as all the beach towels, sarongs, novelty t-shirts, and slippahs you could ever want. Like most travel destinations, Airbnb is cheaper and more authentic than a hotel. Here’s a bungalow with a view of the bay for $85 a night! If you’ve never used Airbnb before, here’s a $40 credit towards your first booking. Hawai’i has a very love/hate relationship with tourists. Tourism is hands down the biggest industry in Hawai’i, but unfortunately, a lot of people got their ideas of what Hawai’i is from watching Elvis movies. Most of the things people tend to associate with Hawai’i (grass skirts, tikis, etc.) are actually very far removed from genuine Hawaiian traditions and culture. But because this is what tourists have come to expect, many people who work in the tourism industry have to make their living selling a fake vision of their homeland to visitors. It’s left a lot of locals feeling pretty jaded, and sometimes even a little hostile to tourists. I don’t say this to scare you off! 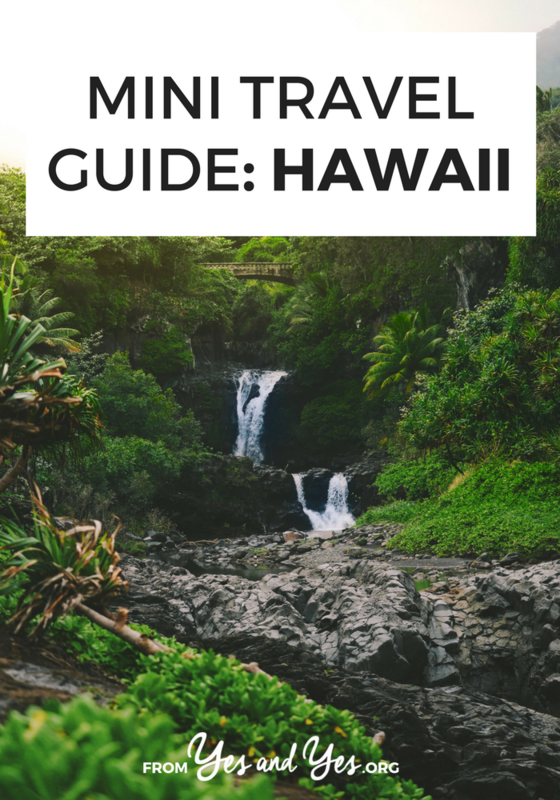 But if you want to endear yourself to the locals, try to leave your ideas about Hawai’i behind when you disembark from the plane and instead try to learn as much as you can about the islands while you’re there. They’re a beautiful and unique place to be! Thanks so much for sharing, Jennifer! Do you guys have any Hawaii travel tips to share? Matsumoto Shave Ice up on the North Shore is both delicious and fun; my family always makes sure to stop there! If you enjoy walking, I'd also suggest an afternoon at the Dole Pineapple Plantation (the pineapple maze is an excellent challenge) and a hike past the Makapu'u Point Lighthouse, where you may glimpse some whales off the coast. How about the Bishop Museum for some Hawaiian history? 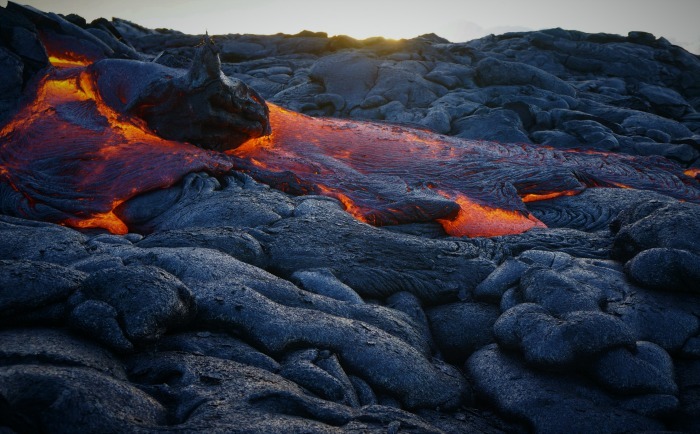 My husband and I honeymooned on Maui, and it was one of the best experiences ever. We loved it so much – I even got myself a plumeria tattoo while we were there to remind me how special it was. We're looking forward to the chance to return! Definitely recommend visiting the Bishop Museum and Iolani Palace. They're wonderfully curated and a great way to learn about Hawaiian history. If you have a car, a trip to Jelly's in Aiea is a must! It's a fantastic books & music store, but they also sell board games, musical instruments, movies … almost anything you can think of! I've lost many hours roaming around Jelly's. Bubbies on University in Honolulu is THE best ice cream parlour. I highly recommend the ice cream mochi, but their sundaes are fantastic. I also recommend Leonard's on Kapahulu for malasadas (Portuguese-Hawaiian doughnuts) and Liliha Bakery for cocoa puffs (like cream puffs, only filled with chocolate and topped with "chantilly"). Oh, I forgot to add: Waikiki can be a bit of a zoo, so I always recommend walking down to the other side of the Ala Wai and soaking up sun on the Ala Moana Beach. It's bigger than Waikiki and infinitely less crowded. Stay away from the Ala Wai and you'll be able to set your blanket down wherever you like. OMG, I love Jelly's! I played D&D there a bit in high school, and I DEFINITELY lost a lot of time and money in that shop. I ran out of space to talk about Ala Moana Beach Park, but I do love it there! Same Diamond Head views, waaaaaay less people. Magic Island is nice, too! Can you camp in Hawaii? I know there are campgrounds that are mostly touristed by the locals. That might be a good way to travel on the cheap. Has anyone ever done that? Camping is definitely a good way to go! There are some lovely campgrounds, and there's a lot of really fantastic places to hike as well. Ho'omaluhia is a great campground in Kaneohe, and there are some nice spots up on the North Shore as well. I went to Hawaii for the first time last October and had the time of my life! We stayed in Waikiki and only spent maybe half a day there. Next time we go, I'd definitely be interested in staying on a different part of Oahu or on another island. My favorite experiences were hiking Diamond Head, travelling around the island on a moped, and snorkeling at Hanauma Bay. I didn't know snorkeling would be such hard work! We had delicious plate lunches in Honolulu from Rainbow Cafe, and tasty treats from Leonard's Bakery. There was a tsunami warning during our stay, and the day after the warning we spent some time at Kona Brewing Company where we met a lot of awesome locals. Everyone was so warm and friendly. I can't wait to go back :). Lanikai and Kailua are fantastic beaches if you go to that part of the island! I was just in Hawai'i and it was just MAGNIFICENT! I did try the spam thing but it wasn't much to my liking. We had thought we'd venture off Oahu to, specifically, this tropical plant reserve. But once at our hotel, we basically decided to scrap our list and just take the day as it came. I'm really interested in the botany of tropical flowers and we did manage to get to some places that had enough to satisfy my need. We found ourselves wandering beaches. We found tiny ones where we were basically alone. The food was amazing – ok, not the spam – a mix of east meets west that I was just floored by. And I have travelled extensively throughout Asia so I was surprised that I could still be floored.